The answer to this question starts with another question: Where do you live? Or perhaps, what is the average relative humidity where you live? Relative Humidity (RH) is a measure of the moisture content in the air, in Ireland we have a very humid climate with the average outdoor RH being 88%. To ensure that our homes are comfortable and healthy it is recommended that indoor RH be in the region of 40 – 60% RH. It is essential that HRV systems can adequately achieve this 40 – 60% RH indoors to eliminate condensation related issues. 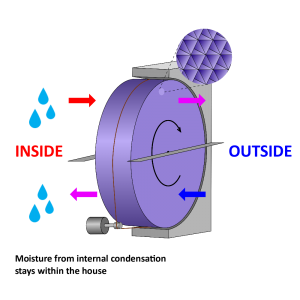 A rotating wheel system ensures that the moisture leaving the house deposits on the exhaust side of the wheel, then evaporates back into the supply air. This means that the same moisture collected in the thermal wheel is returned to the house. Consequently there is no net reduction in water content in the air. This is a big advantage in drier climates where there is low humidity and low water content in the air. We need to ensure that high humidity levels caused by living activities such as cooking, cleaning and washing are removed from our homes to avoid condensation internally. We must also ensure that the moist air from outside has humidity levels reduced to ensure we are not just taking in moist air which can cause condensation issues. However, for areas where the relative humidity is high, such as Ireland and the UK, this is a significant disadvantage. For much of the time our relative humidity is in excess of 88%, where a comfortable indoor environment should ideally be between 40% and 60%. There can also be significant issues with regard to condensation indoors if humidity levels are not reduced. A counter flow heat exchanger will resolve these issues by achieving a reduction in humidity to between 40 % and 60%. When the warm, moist air moves through the exchanger, it gets cooled beyond its dew-point, water condenses in the outgoing channels and drains off at the bottom of the unit. In this way, humidity is controlled and condensation problems eliminated. For the Irish market we exclusively design and install air handling units that use a counter flow heat exchanger in its core as opposed to the rotating thermal wheel. With the average relative humidity in Ireland around 88% it is essential that within airtight houses humidity levels are reduced, for increased comfort and to avoid condensation problems. 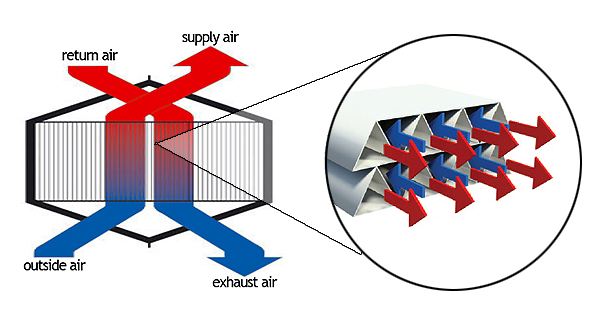 Rotating thermal wheels, whilst highly efficient return the moisture back into the building. There is no net reduction in the water content of the air and the relative humidity is not reduced. See link for more detail re indoor air quality.